[parapsychology book series] A paranormal puzzle smoulders in the desert heat of southern Arizona. At the home of Jack and Chloe Monroe, a written message “Leave Now” appears then disappears, a candle in an empty room mysteriously lights itself, and – most enigmatically – an unidentifiable ethereal whisper begins to permeate the house. What was once simply strange now feels sinister. What once seemed a curiosity now seems terrifying. Dr. Luke Jackson, a British Parapsychologist visiting family nearby, is asked to investigate and quickly finds himself drawn deeper into the series of unexplained events. Time is against him. He has just one week to understand and resolve the poltergeist case before he must depart Arizona. A most unusual detective story. Want to dive into the science and learn about Extra Sensory Perception, Psychokinesis, Ghosts, Poltergeists and more, but don’t know where to start? Or you don’t want to wade through dry academic textbooks? Welcome to The Hidden Whisper! Beyond an interesting and captivating story, the author also successfully adds an extra dimension that provides his readers with an excellent education in the basics of real life parapsychology. 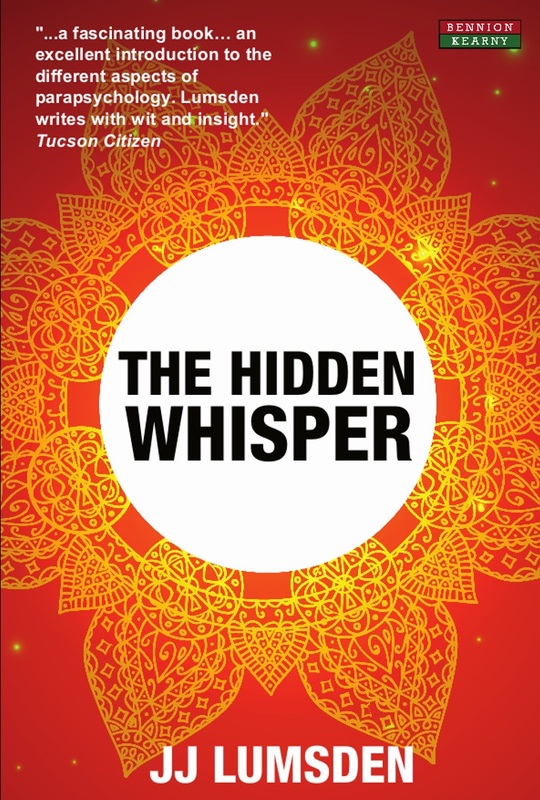 Skeptics and believers in the paranormal alike will enjoy JJ Lumsden’s The Hidden Whisper. http://publicparapsychology..
Dr. Lumsden may well have created a new art form… a story placed in an educational context that informs as well as entertains. We might dub it www.fiction.edu and hope that there will be others of its genre. Professor Stanley Krippner, AHP Perspective. Here’s a novel novel. J. J. Lumsden has written a story about a parapsychologist investigating an apparent poltergeist, using the plotline as a vehicle to provide serious information, in the form of endnotes, on psi research. The result is entertaining and instructive in equal measure, and will appeal to SPR members as well as the general reader who would like to know more about parapsychology. Society for Psychical Research Book Review. Why did you write a parapsychology book? When people find out what you do, a good few questions normally follow. Some people think the paranormal is nonsense, others less so. It just seemed clear to me that folk might like an easy-to-read and accessible book that illuminates parapsychology and the paranormal. Why did you choose this ‘novel / popular science’ format? Just so the book isn’t too full-on. People can dip in and out of the endnotes when they want to learn more about particular topic areas, whilst (hopefully) enjoying the main part of the book as a standalone story. How do you become a parapsychologist? Parapsychologists hail from a number of disciplines including physics, philosophy and psychiatry (lots of ‘P’s it seems), but most have psychology backgrounds (mainly experimental, but also clinical). There are a couple of universities in the UK that teach parapsychology, both as courses at the undergraduate level, and as postgraduate qualifications. I did my doctorate at Edinburgh University’s ‘Koestler Parapsychology Unit’, which is part of the psychology department. Since it was founded in 1985, the KPU has turned out over two dozen PhD graduates, and been home to scores of laboratory experiments. Any lecture tours planned? What about in the USA? I think we’ll have to see how well the book does first. I really loved The Hidden Whisper. Fantastic! The book would make a great movie – any chance we’ll see Luke Jackson starring on the Big Screen? In the book, you discuss Zener Cards. Do you have any pictures of what they actually look like? I’ve placed some sample Zener Cards on my blog here. A pack of Zener cards would contain five of each card type; twenty-five in total. I’ve seen Ghostbusters. Do you live in a Firehouse and drive a Cadillac ambulance as well? Summarize your book in 10 words or less. Columbo meets Scooby Doo meets Stephen King. Is it true that cockroaches have been used in parapsychology experiments? Book Categories: Fiction, Parapsychology and Science.